We've all seen these adorable cupcake stands made out of vintage plates and inexpensive glass candleholders, and most of us have even created one or two. They add some cottage sweetness to any party, shower, or just for display. Opening my new May 2012 Country Living UK magazine, this image was one of the first I saw. 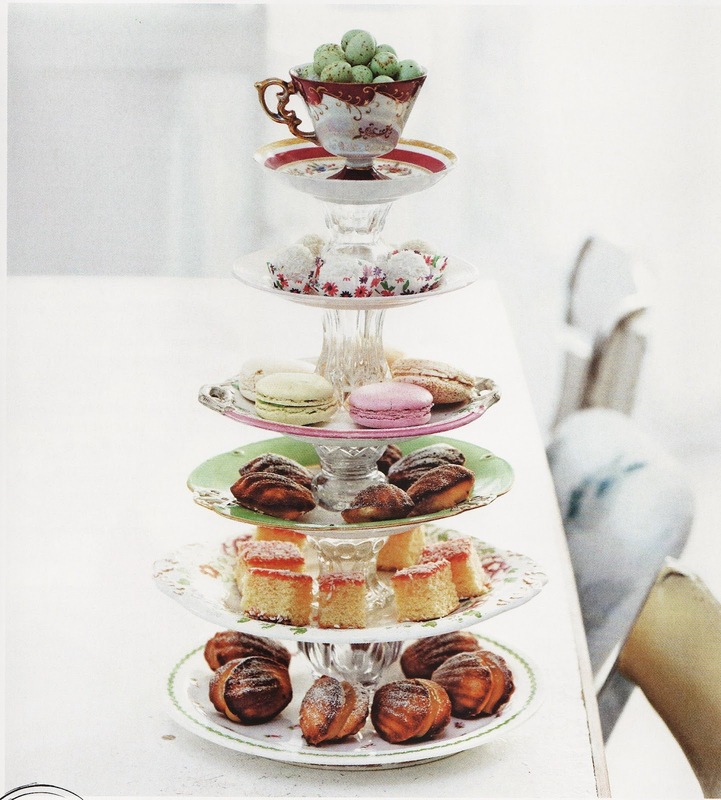 Not just one or two stacked plates, but a tiered cupcake stand made out of multiple layers of mismatched vintage plates and saucers, topped off with a delicate cup to contain those individual goodies that might otherwise escape. With Mother's Day coming up this weekend, I thought this would be a fun addition to a feminine buffet layout. Then surprise Mom and send it home with her, being sure to include just a few extra bites of those delicious confections. wonderful sponsors on my sidebar. The link party is open all week. I love the way they did that, Debra! 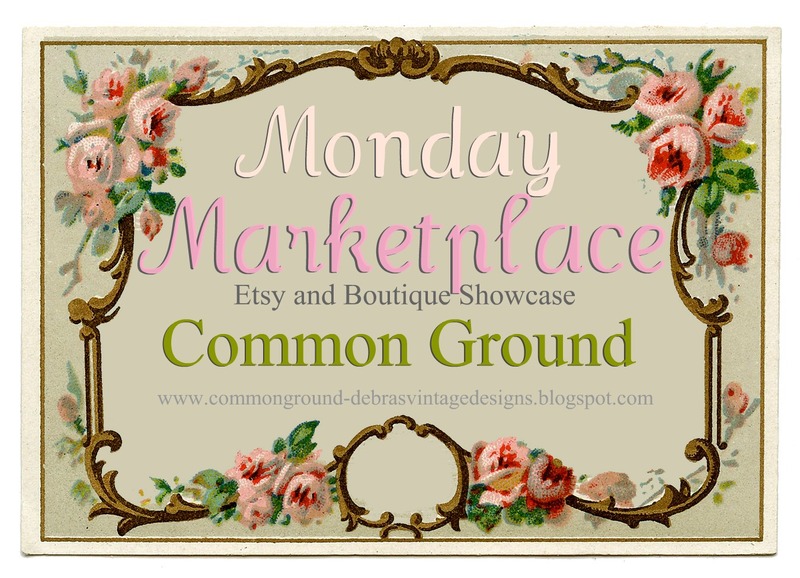 What a fun way to use some thrift or vintage finds. This cupcake stand is such a great inspiration and just in time for Mother's Day. Thanks for hosting the link party below. What a great idea. I hope you don't mind if I borrow the idea! How beautiful, love this idea. Thank you for sharing and can't wait to see how you do yours! Enjoy your week. That is so sweet, dear Debra-I love the many plates ,and the cup for the sweets on top. So wonderful an inspirations dear friend...thankyou, and a happy tuesday to you. Love this idea. I have to run out and get the magazine! Thanks for stopping by, love hearing from you. This is a very pretty cupcake stand. I think I might try making one myself! I got a new tube of glue just waiting for a project! Aren't those cute Debra? I have made a few in the past and have a few in my shop also. I was thinking of making one for a party we're having Saturday night. They are so easy to do also! I love this idea.Looks so pretty. That is so fun and will always end up being unique! How awesome it is for you to share this idea as a mother's day DIY gift. saucers/plates... so delicate and pretty. Too cute and how creative!! Such a beautiful gift this would make!! Love the use of vintage plates!! Very pretty Debra...I should try doing one with all the plates that I have. Oh this is just SO beautiful! Thanks for bringing it to our attention -- such a great way to use those individual pieces we come across to create a stunning serving piece! Can't wait to see what you come up with! What a cute idea. I have so many mis-matched plates and this would look adorable on my hutch. Love the cup topper too. These are "sweet" (sorry, couldn't resist)! Saw some in Brimfield yesterday made from vintage silver (with quite a hefty price tag)! Oh Debra, I think we're going to see this everywhere now. What an ADORABLE idea..I so want to copy it as well. Can't wait to see your version and what a great idea for a gift for your mom. This is so pretty! And I love the tea cup perched on top. How lovely, thanks for sharing such beauty! That's so pretty BUT where would you store such a thing? I wouldn't have a cupboard that would fit it!